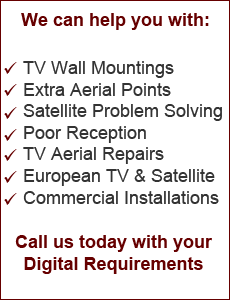 A4 Digital offer Satellite Services throughout Liverpool. Freesat installation Liverpool With over 140 channels, and growing every day, Freesat is becoming a great alternative to Freeview. With free High Definition viewing and with more and more channels being added every day, it’s proving to be popular in areas where digital coverage is poor. For the unlucky few that really do live in the middle of nowhere, Freesat is now both an affordable and effective alternative. With our team of Certified Satellite and Aerial Installers, we can get you up and running in no time. Whether it’s to watch Sky, Freesat or even another service, our team of expert Freesat Installers can provide you with everything you need. Call our engineer now on 0800 6122051 or 07902 204 779 or fill out our contact form for some FREE advice or a qoute. We Install in Liverpool, Wirral, Widnes, Runcorn, St Helens and Warrington.